Væg-monteret signal-transmitter med display, for Relativ luftfugtighed og Temperatur. 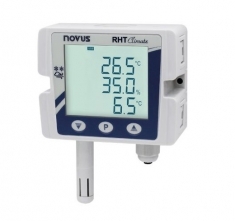 The RHT Climate sensors are suitable for general use in HVAC applications, monitoring or climate control of environments, and environmental monitoring of industrial processes where robustness, accuracy, and connectivity are required. With or without a wide backlight display and distinctive design, the RHT Climate is a humidity and temperature transmitter that provides high precision and stability of measurements, over a wide operation range, it calculates in real time seven psychrometric properties, all variables will be available by current or voltage retransmission or by RS485 Modbus RTU communication.